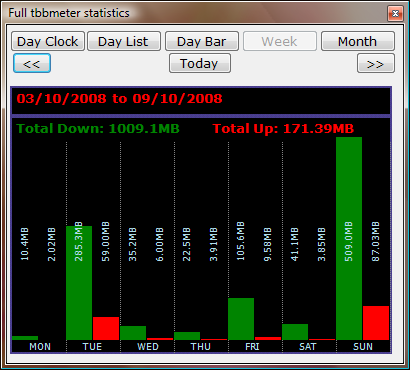 tbbMeter is a "bandwidth meter" which helps you monitor your Internet usage. It allows you to see how much your computer is sending to and receiving from the Internet in real time. It also shows you how your Internet usage varies at different times of the day. It does not record what you do on the Internet (i.e. it doesn’t know what web pages you visit). Set alarms to protect yourself from exceeding your monthly usage allowance. Note: tbbMeter is currently available for Windows XP and Windows Vista (32 and 64-bit versions). It also requires .net 2.0 or a later version of the .net Framework installed to work. this is a very good tool for limited bandwidth users to moniter their usage and save their bandwidth.